The Tornado's Path - Part Three: "The Brave and the Bold"
Trident and Dr. Impossible succeed in freezing the Parasite. Mistaking Black Lightning for Parasite's bodyguard Trident attacks him but discovers that his weapon can be a liability in fighting someone who controls electricity. Dr. Impossible attacks as well, but Jefferson manages to defend himself. Red Tornado visits Boston Brand's grave to try and find the answers to why his body is acting the way it is. The Phantom Stranger appears and while he gives John a lot to think about he fails to provide a solid answer. Green Lantern, Black Canary and Roy Harper fight back against the army of multi-colored Tornado clones. They discover that each color has a different weakness and after finding them Green Lantern is able to take them all down. Back in the Batcave Superman and Wonder Woman vote on Batman's membership into the League. Despite blocking one of Dr. Impossible's discs the villain manages to give Black Lightning a savage beating before popping a Boom Tube and disappearing with the Parasite. Hawkgirl arrives and discovers something stuck to Trident's neck that changes everything. Dr. Impossible delivers the Parasite to Ivo and the mysterious man in shadows. Ivo has Dr. Impossible cut off Parasite's arm and the figure adds the material to the armor they have been constructing. The figure is concerned that armor might not fit him but Ivo assures him it will expand as necessary. Finally, Ivo puts the finishing touches on the headpiece; pointed ears. In Hub City Vixen begins a desperate search for her missing totem before her abilities overwhelm her. In the Batcave Hawkgirl and Black Lightning arrive with the unconscious Trident. Batman informs his former teammate that he had better have a good reason for doing so and once he and Hawkgirl show the miniature Starro on the villain's neck such concerns disappear. Story - 4: So this month the characters and plotlines begin to truly converge. Some may consider this style of storytelling disjointed, but considering how everything came together this issue I have to disagree. The past two installments were certainly broken up, but it was pretty obvious that there was something tying everything together so I didn't put too much thought into it. This issue read a lot faster than the previous two, but that wasn't necessarily bad as it gives the story a good balance between the intrigue and the action. And action was the key this month. Meltzer played around with Black Lightning's abilities and while the dialogue was a bit much, especially the lightning rod bit, the defense that Bruce taught him was rather cool. The Green Lantern/Black Canary/Roy Harper battle was fantastic and Meltzer solidified his take on the Black Canary in showing how savage she could be. He also did some fun stuff with Green Lantern and his use of the power ring. The Phantom Stranger's appearance was much appreciated as well. Given the era that Meltzer started reading the book I would have been surprised if he didn't since the Stranger showed up a number of times during the seventies. He may have been vague but he was an interesting character for the League to encounter. His bit in this issue felt just right, but I like the whole ambiguous answers to real questions thing if it is done correctly. I was glad to see only two bits with the Trinity in the Bat Cave. It worked great in the first issue and was tolerable last month but this time around it would have been redundant. The fact that the Trinity voted on each other was a neat little wrinkle to throw in, though it seems like a foregone conclusion that they would be members. The deeper we get into this crucial first story the more I feel that Meltzer's time with the League will not only be well written but will be kind of fun as well. This issue played to my more fannish sentiments and even though more and more Justice League villains are getting thrown into the mix I don't see the overall story getting lost. 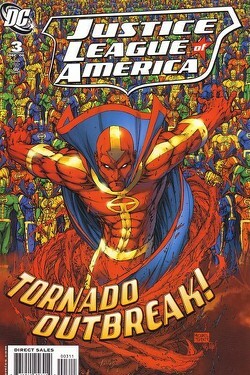 Meltzer has proven that he can juggle a large number of characters into a complex, engaging stories and he continues to do that with "The Tornado's Path". Art - 4: Ed Benes (along with Sandra Hope and Mariah Benes) is such a good match for Meltzer's writing. He seems to get what the writer is going for and like Rags Morales on IDENTITY CRISIS he juggles a broad number of characters and locales and makes it look easy. This month the highlight was the fight that pitted Green Lantern, Black Canary and Roy against a host of Technicolor Tornados. The pacing in this scene was dead on and the two-page spreads featuring Black Canary going up against the yellow colored Tornado clone followed by Green Lantern letting loose with his ring were well worth the cover price. Special kudos goes out to colorist Alex Sinclair this month. The coloring on the Technicolor Tornados couldn't have been easy, but they all looked fantastic. Cover Art A - 4: (Standard Cover by Michael Turner and Peter Steigerwald) This cover really needs to be made into a jigsaw puzzle. That would be so freaking awesomely hard. And I'm talking a 5000 piece puzzle here just to make it even more difficult. Seriously, this was a great cover. Turner's covers have been rather strong, but this one must have been a nightmare to do even if the individual Tornados were drawn, scanned and manipulated together. The end result is a great, eye catching cover that actually has something to do with what happens inside the comic. Cover Art B - 3: (Alternate Cover by Chris Sprouse, Karl Story and Alex Sinclair) Well, that certainly is Superman and he sure is...standing there. Seriously, it's a nice piece of art and all but what kind of variant cover is this? 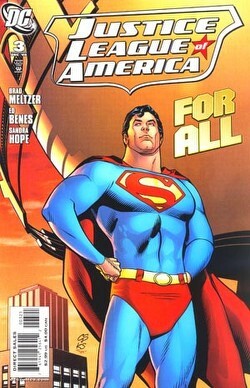 I like Superman. A lot actually but there has to be more than him standing there with his fists on his hips to get me to think, "Gee, I want to plunk down ten bucks for this cover because I just have to have it." This is probably the weakest variant cover to date. It's nothing against the artists, but it does absolutely nothing for me.